Pity the poor Native Americans when they have to deal with Moe, Larry and Curly as settlers! Moe, Larry and Curly go West, young man! After Curly wins $50,000 the Stooges move in to the Hotel Costa Plenty – and do plenty of damage! How much will be left after taxes? The Three Stooges trade their restaurant for a broken-down race horse – until they feed him red-hot peppers! The Three Stooges do a ‘sit-down strike’ until their sweethearts’ father will give them permission to wed — and then they have to build the house! In a case of mistaken identity, the Three Stooges are hired by a rich woman to redecorate her house …. The Three Stooges (while singing the Lollipop song) are artistic failures in France, and think that the French Foreign Legion will help them get home — whoops! The Three Stooges are hobos who find themselves employed as nursemaids to the professional wrestler Bustoff — when they fail to keep him sober, Moe has Curly try to take his place! The Three Stooges are pest exterminators, who are mistaken for male escorts, and hired by a rich society matron to impress her guests! Moe, Larry and Curly take a job, selling memberships in a duck hunting club to the police and the mayor! Unfortunately for them, it’s a scam, and where are the ducks? Moe, Larry and Curly are inept firefighters who have to rescue the fire chief’s daughter from a fire in their own fire station! A personal favorite Three Stooges short film, where Curly’s wishes come true, and they help a widow (and her beautiful daughters) keep their oil-rich land from con men. The Three Stooges are trying to sell fur coats in a hot South American company, and accidentally get caught up in a revolution — and all factions keep trying to put them in front of a firing squad! Cast in a Tarzan-like movie at the studio where the Stooges are janitors, all seems well in Africa — except for the gorilla, and the cannibal! A classic Three Stooges short film, mocking the idle rich, where the Stooges are mistaken for psychiatrists who have to “cure” an irresponsible young wife! A classic Three Stooges short film, where the Stooges are hired to find a missing archeologist, and so they take a cab to Egypt (!) and look for the lost tomb of Pharaoh Rutentooten! The Three Stooges are working as waiters in an Old West saloon, who have to raise money to pay off their girlfriends’ debts — and they go off prospecting, and “dig up” some of their crooked boss’ stolen loot! 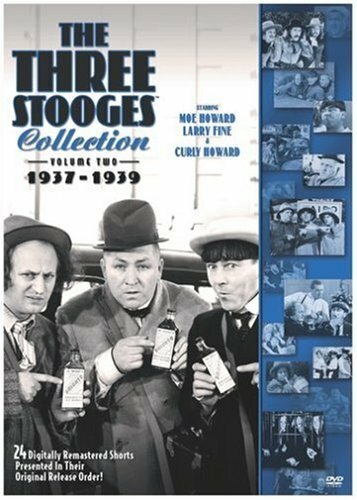 Get ready for more outrageous antics as The Three Stooges return in this second collection of chronological masterpieces. These 24 shorts, filmed from 1937-1939, are digitally remastered for the highest quality – every sight, gag and knuckle-cracking sound can be seen and heard with the utmost clarity for maximum effect. This period is considered to be when Larry, Moe, and Curly hit their stride and perfected their craft, when all the elements came together perfectly: the writing, directing, pacing, and performances. It’s no wonder The Stooges made some of their best films during this period, proving laughter really is the best medicine in such classics as Dizzy Doctors, Saved By The Belle, and Calling All Curs. And audiences agreed – at least most of them did. By now The Stooges were wildly popular and their personal appearances were mobbed, but there were some who thought they were too violent and who over analyzed their eye-poking, pie-throwing behavior.